The 23rd Annual Recognition Dinner hosted by the Marian Club of Notre Dame Jr./Sr. High School will be held on October 1, 2015 at 6:00pm at Hart's Hill Inn in Whitesboro, NY. The Marian Club of Notre Dame was founded in 1990 for the purpose of preserving and promoting Catholic education in the greater Utica area. This organization is independent of Notre Dame Jr./Sr. High School and is administered by a Board of Directors. The annual Marian Club dinner recognizes individuals that have had an important impact on our school and our students. We are pleased to announce that this year's honorees are Tom Moore and Rev. Joseph Salerno. This year we will also be inducting two members into our Brother More CFX Sports Hall of Fame. These individuals have played a role in the great history of Notre Dame athletics. We are pleased to announce that this year's inductees are Mike Durr and Gene Leuthauser. The Marian Club Members cordially invite you to attend this special evening to help honor these four deserving individuals. Dinner tickets are $40.00 each or a table of eight (8) for $300.00. Tickets can be purchased by calling (315) 724-5118, ext. 0 or by clicking here. 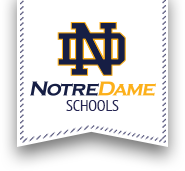 Your generosity will ensure a successful evening for all and the funds raised by this dinner will go directly to benefit the students of Notre Dame Jr./Sr. High School.